This is another one of the tuna rolls that we made oh, about three months ago. Behind? Who, me? Okay, fine, you win. I am waaaaaay behind in my sushi posts, and I’m not done yet! We still have a bunch more tuna rolls left to post! I know what you’re thinking, “Maybe you should post more often Allison!” Yeah, I know. I should. What with me graduating in a few months and trying to make sure I have all the right classes I need to graduate and trying to figure out what’s going to happen after I graduate, I have gotten a little behind in my posts. Time has been going by so fast! I guess that’s what happens when I’m busy. I post something and before I know it, more than a week has gone by and I still haven’t posted something new! Oi. Oh, and happy belated Valentines Day! In case you are wondering, Son didn’t get me flowers or chocolates or jewelry or anything like that. No, it was MUCH more exciting. He got me cookbooks! 😀 He knows how to make me happy hehe. 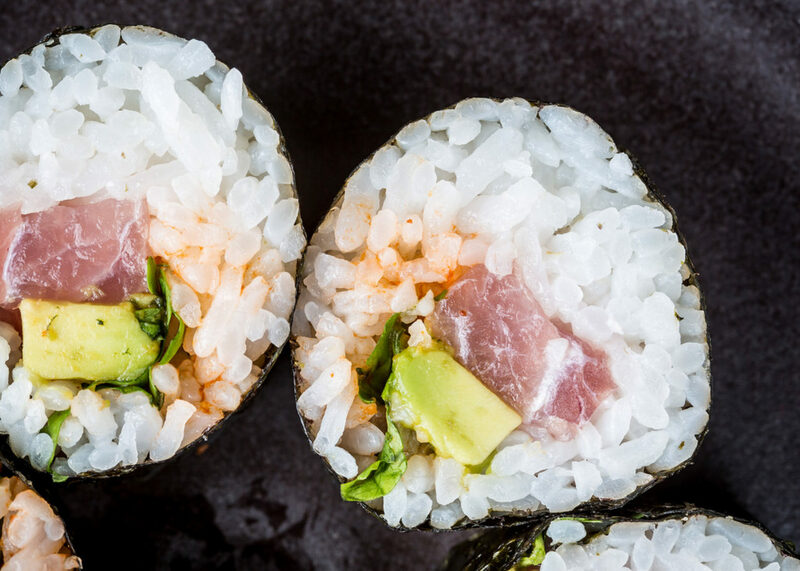 Roll the sushi, using some avocado, several cilantro leaves, a few sticks of tuna, and about 1/2 tsp of Sriracha sauce as your fillings. Cool, now we can shop at your store. It’s always fun to browse through bloggers stores because there so many neat finds. We don’t have to go to the mall to find cool stuff. Thanks! 🙂 Thanks! I don’t have much in the store yet (as you can see, only the shirts) but I’m hoping to expand soon! This actually sounds kinda delicious. Well, if you are ever in the LA area, let me know and I’ll make you some sushi! I have absolutely NO idea where the name came from. Anyone know? Just want you to know that this roll was originated at Maschiko, the best sushi restaurant in Seattle. This I know because I’ve been going there for years and the Red Violin is my favorite roll. In fact, I’m making it tomorrow. Did you know this?